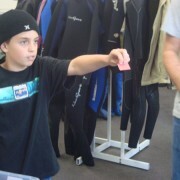 MARINE DREAM — Tyler Van Der Lip distributes information on a plan to create a manmade reef at Paradise Cove. 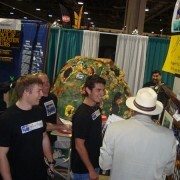 The small igloo-like object Van Der Lip is holding is a scale model of one of the reef balls that would be placed on the ocean floor to create the reef. 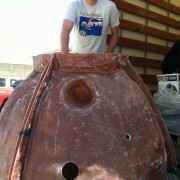 The balls are hollow to provide habitat for marine organisms and flat on the bottom to maintain anchorage. The project is the brainchild of fishing activist Chris Goldblatt, who grew up in Paradise Cove. The reef balls, which can weigh up to 1000 pounds are made of concrete, sand and silt dredged from harbors, and ground oyster shells. Placed on reef-less expanses of mud and sand, they would provice anchorage for kelp forests, habitat for a wide range of marine life, according to Goldblatt. “It’s like planting trees in the Amazon,” Goldblatt told The Malibu Surfside News during an interview last year. 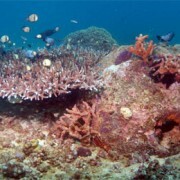 Goldblatt says that the reef would become an underwater oasis in a desert of mud where no reefs currently exist. Fishing activist Chris Goldblatt has been an outspoken critic of the Marine Life Protection Act Initiative plan to create a Marine Protected Area off the coast at Point Dume that will restrict fishing, but he says that he hopes to unite both sides of the MPA debate in a project to build an artificial reef at Paradise Cove, just outside the Point DumeMPA. 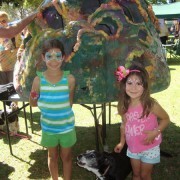 Goldblatt’s Fish Reef Project is operated under the auspices of the public non-profit Reef Ball Foundation. Goldblatt says he envisions creating an artificial reef of between one and four acres in 40 feet of water a quarter mile off of the Paradise Cove Pier. The reef would be designed like a wheel, with spokes extending out from an oval hub to provide an optimum mix of reef and open sand. 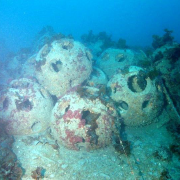 The reef balls, which can weigh up to 1000 pounds, are made of concrete, sand and silt dredged from harbors, and ground oyster shells. Placed on reef-less expanses of mud and sand, they would provide anchorage for kelp forests habitat for a wide range of marine life, according to Goldblatt. Goldblatt, who has written two semi-autobiographical novels for young adults that involve fishing adventures, spent much of his childhood fishing at Paradise Cove. Goldblatt said that at the age of 10 he began working on the sportfishing boats that launched from the pier, prior to the 1983 storm that swept most of the structure away. Goldblatt said he also learned to dive at a young age, often diving solo—at night—off Point Dume. By the time he was 19, Goldblatt was captaining fishing boats. He told The News that fishing was a lifeline for him when he was growing up. He received a degree in fisheries managment from Hawaii State University. Goldblatt said the Paradise Cove reef has the potential to become “a thriving kelp forest for white sea bass, black sea bass, calico bass and lobster.” He added that the balls, which are hollow inside and perforated with large holes, could also provide ideal habitat for abalone, which was once abundant along the coast in Malibu. The reef would also provide refuge for juvenile fish and an anchorage for phyto-plankton and zooplankton. “The reefs will allow plankton to become marine life,” Goldblatt explained. All contributors to the non-profit Fish Reef Project will become members of the program, receive quarterly updates and be invited to the reef christening ceremony. Those who contribute $5000 or more will have the opportunity to include the ashes of a loved one in the casting of a reef ball. Participants who donate $10,000 will also receive that right, as well as having a brass plaque fixed to their reef ball, GPS coordinates and a bi-annual update, which will include photographs of the reef’s progress. Goldblatt says he does not wish to be beholden to corporations or federal grant money for the reef and is instead seeking donations from the public and businesses to fund the entire project. “Paradise Cove was the site of the first man made reef in California,” Goldblatt told The News. “In the early 1950s, cars were dumped, which created nice habitat, but eroded in less than a decade.” The legislature recently passed the Artificial Reef Bill, which recognizes the great importance of making reefs. “The permitting [process] is expected to be a gauntlet of more than six local and state agencies, but with the support of the community we are confident that in six to eight months that we can begin to place our reef balls, reef structures,” Goldblatt said. “We are very careful to create reefs only on sandy or mud bottom, never disrupting existing reef systems.” He added that the reef would not cause sand flow issues and that it would not be a hazard to boats. “I have seen how hateful the MPA debacle has become and I and others have decided to extend an olive branch, bury the hatchet, and work towards a reality-based environmental project that all sides can agree on and benefit from,” Goldblatt said. Note: Our non-profit status is currently pending, we will notify you when it finalizes so donors can take the tax deduction at that time. Locations: the initial location will be near Santa Barbara – the goal is to put a fish reef near every harbor in Southern California within 3-5 years. 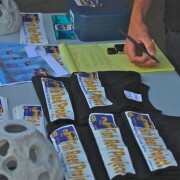 Dedicated Fish Reef Volunteer Tyler Vanderlip raised awareness about reef benefits in Malibu. 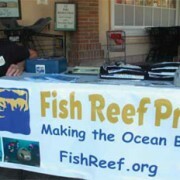 ebruary 2012: Dedicated Fish Reef Volunteer Tyler Vanderlip raised awareness about reef benefits in Malibu.